On Wednesday 13th June 2012 - we left a very wet, dark and cold Dublin to arrive in Bucharest to a very sunny, bright and hot day. Though we knew there was a lot of work ahead of us, we were delighted to be changing from our jumpers and into our shorts and sandals. The purpose of our stay was to conduct a monitoring visit with ANUP, our Romanian Partners. As the lead partner in Sunia Geel, Exchange House conducts these monitoring visits to coordinate activities across all countries in line with the agreed programme. However, the visits also give us a much better sense and understanding of the great work partners are doing when delivering front line services and other programme elements such as training seminars, conferences and various work streams. In Romania we reviewed the progress of Sunia Geel, identified and addressed areas that need additional support, met stakeholders and went over financial and budgetary resources. We timed the visit to coincide with the Sunia Geel Slobazia Domestic Violence Conference. 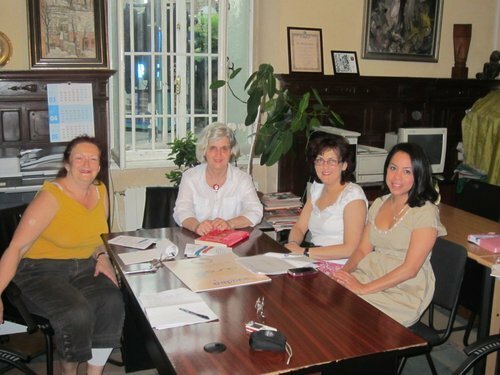 We met our gracious hostesses from ANUP late Wednesday afternoon to go over the agenda of the monitoring visit, review finances, discuss the Ialomita, Slobazia Sunia Geel DV Conference and meet the great people and supporters that are making Sunia Geel possible in Romania. After a solid afternoon of work spent going over workstreams of agreed domestic violence trainings, training manuals, flyers, lesson plans, seminars and counselling to children and families, Ileana took us for something to eat. As the weather continued to cooperate we had a lovely dinner at an outdoor restaurant in the middle of Bucharest. Thursday was spent preparing for the upcoming meetings, in particular discussing and planning the DV Seminars and identifying new communities to target. Paper work and financial accountability is an essential part of any multi partner EU project and we made a lot of progress in ensuring all of these requirements were met. Though we often speak on the phone, it was great to meet in person to share experiences, discuss difficulties we are facing and offer support where needed. On Thursday despite torrential rain we met with Ms Mariana Duliu, Director of the Casa de Cultura "Friedrich Schiller" and Popular University Ioan I. Dalles, Bucuresti as well as Ms Alina Moisescu, General Inspector at the Ministry of Education, Research, Youth and Sports. It was great to have an open and honest discussion about the different approaches used in addressing domestic violence with young people. How to better assist teachers in identifying and referring domestic violence cases they see in schools to the appropriate services and, more importantly, it was great to learn from one another. During our monitoring visit we also had the opportunity to meet with the General Director of the DGASPC - General Directorate for Social Assistance and Child Protection in Ialomita, Prof. Paul Marcu. We found Professor Marcu to be incredibly supportive and interested in continuing to find ways to address domestic violence. There is already a great partnership between ANUP and DGASPC. ANUP has done a superb job at bringing together the different stakeholders and working to address domestic violence not just in the Roma community but in the rest of the general population as well. On Friday after having driven for over 2 hours we joined ANUP-International staff and over 75 social workers, police officers, government officials, clergy members and policy makers at the Sunia Geel Ialomita Domestic Violence Conference. The aim of the conference was to address the need of Romanian social workers for additional Domestic Violence training, to share experiences between Ireland and Romania and to learn from each other. Psychologist-Manuela Iordache from the Emergency and Reception Centre for the Victims of Domestic Violence and Psychologist Nicoleta Matei from the General Directorate for Social Assistance and Child Protection -Ialomita presented on their work. Exchange House presented the research findings in the five countries involved in Sunia Geel and current domestic violence policy and services in Ireland. This research was undertaken by our Greek Partners from Prolepsis. After sharing information about Sunia Geel and the work that the five partners are doing we outlined the work of Exchange House in addressing domestic violence in the Traveller community. There were many questions from the Romanian social workers, police, judiciary and policy makers. Overall we were very moved by the genuine desire to learn and address the difficult issue of domestic violence in the community of Ialomita and Slobozia despite the budgetary constraints. It was a great opportunity to compare approaches in Romania and Ireland. Though we might have different approaches and practices, different policies and speak different languages, we also found many similarities in how we go about tacking domestic violence as well as supporting women and children affected by domestic violence. In particular, it was great to learn that in both countries social workers are extremely committed and dedicated to helping women and children leave the vicious cycle of domestic violence. We spent the next two days travelling over 650 kilometres around Slobozia, Transylvania, Sibiu and Bucharest. It was a great opportunity to meet people, learn about their lives, families and their dreams. We were very humbled by their generosity and warm hospitality. We also had the opportunity to meet a number of front line service providers and learn about the great work they are doing. There were clear differences of resources, architecture and even weather in the different villages we visited. Some families were much more religious than others. Others were just more reserved. What was clear was the common and genuine desire to address and deal with the issue of domestic violence in marginalised communities. We left Romania feeling exhausted but inspired by what we had seen and renewed in our commitment to working with partners in Ireland and other EU countries to improve the effectiveness of our work with those experiencing the horror of domestic violence.